Alzheimer’s sufferers have to make numerous adjustments to their day to day existence and the effects on their health and their symptoms will vary in nature and will progress at different rates. Symptoms can include an increase in fatigue and the loss of your ability to perform many everyday tasks that you’d previously taken for granted as your memory loss deteriorates. It often takes much longer to accomplish even the most basic of tasks and it can cause confusion and disorientation. A symptom which often causes people the most psychological damage is the progressive total loss of self-control. This can lead some sufferers to experience feelings of loss of self-esteem and can be accompanied by severe mood swings. Firstly, in order to come to terms with Alzheimer’s, it’s crucial that sufferers accept that it is a physical disease of the brain and not some form of mental illness. Coping with Alzheimer’s is all about coming to terms with your memory loss and accepting the unpredictable. You’ll often find that as the disease progresses, you’re sometimes able to perform certain tasks then at other times you won’t be able to. Then, perhaps a few days later you can perform them again. Tasks that you used to be able to do without thinking will often need to broken down into separate smaller steps. It’s therefore important that you ask loved ones to show patience and to have them get used to explaining things to you in much greater detail whilst keeping things simple. As a carer for somebody with Alzheimer’s, you’ll need to start to learn how to communicate with your loved one differently as the disease progresses and adjust your communication style appropriately. Establishing daily routines and activities for the patient is very important. Even as the disease progresses further, it’s important that you inject some fun into the patient’s day and that you encourage them to maintain social contact with people. This is still the case when Alzheimer’s progresses even further towards the advanced stage. It might be necessary to rearrange things in the house for ease of use, comfort and safety and to minimise dangers and risk. And, as the patient becomes less able to do things for themselves, you’ll need to sensitively and tactfully help them to do things such as getting dressed and washed. However, in the early stages of the disease, you should try to encourage the patient to do things for themselves for as long as possible until it presents a risk or they are no longer able to cope. One of the most tragic things about Alzheimer’s from a carer’s perspective is that many carers will comment how the sufferer no longer seems to be the same person they knew. However, it’s always important to remember the value of the sufferer as a human being. Help and support, both practical and emotional, is vital to the sufferer so it’s still important that you speak to them and show affection even though you feel as if they can’t understand you as their health deteriorates. It’s also necessary to learn how to cope with the sufferer’s mood swings and not to let that affect you personally. Remember that the sufferer does not realise what is going on or how their behaviour might be affecting you. 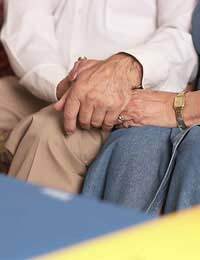 Ultimately, as a carer for somebody with Alzheimer’s disease, your ability to cope will often come down to your acceptance that your loved one’s condition is only going to get worse, not better. Even on good days, it’s important not to raise any hopes of recovery because there isn’t any. Your life as a carer will be radically transformed and it can take a huge emotional toll on you. That is why it’s far better if you’re in a position to enlist other family members and close friends to shoulder some of the burden so that you’re able to recharge both your physical and emotional batteries from time to time. Your local social services department will also be able to give you advice on obtaining respite and taking a breather from your responsibilities to your loved one. this is so difficult to cope with if it's your own partner who is suffering from it. It's like having to love and care for a complete stranger. You get the odd flash of the old person but mostly it's never the same as it used to be. They can get angry because they know something's not right and that's even harder to deal with. Love and care is what they need, but it;s so hard to give if you've been close in the past. I would love to hear of a cure for alzheimers more than anything else in the world.